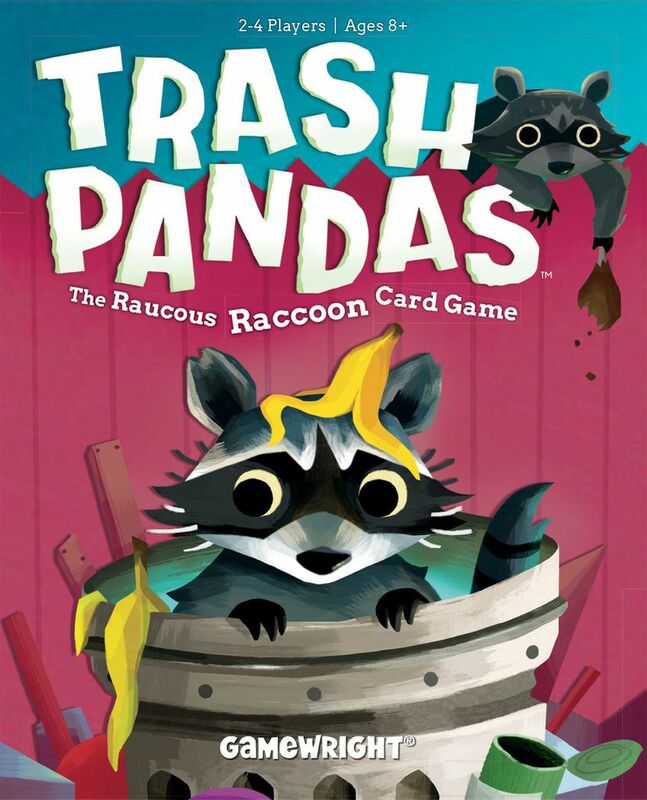 Trash Pandas is a game by Lisa J. Eskue and Michael E. Eskue, published by Gamewright Games. It is for 2-4 players. In this game, players take on the role of some rowdy raccoons, as they tip over trash cans in their hunt for the best morsels and shiniest objects. Of course they’ll have to be careful as their opponents may try to steal their uncovered goodies. On top of that, if they get too greedy, they may walk away with virtually nothing to show for it. In the end, the player that can gather up the most goodies and thus the most points, will be declared the winner. To begin, take the Token Actions card and place it within view of all players. The first player is chosen. The cards are all shuffled together. A number of cards are then dealt out face down based on each player’s turn order. The first player will receive 3 cards. Player 2 gets 4. Player 3 gets 5 and Player 4 gets 6. The rest of the cards are then placed face down in the middle of the play area to form what’s known as the Trash Can. The 6 wooden tokens are placed in the middle of the play area near the deck. The first player is given the die and play now begins. The game is played over a series of turns, with each player taking a turn consisting of 2 steps; Roll the Die and Resolve Tokens. First off the player must roll the die. Afterwards they will then take the token that matches the die result from the middle of the play area and place it in front of themself. They can then decide to stop or continue rolling. If they choose to stop, then they move on to the next step, resolving tokens. If they choose to continue, then they will roll the die again. Once more they will take the token that matches the die result and place it in front of themself. However if the die result matches a token that they already have, then the player busts and must skip the Resolve Tokens step. They must then place any tokens that they collected back into the center of the play area, passing the die to the next player in turn order. It should be noted that even though the player must now skip the next step, they are allowed to draw 1 card from the Trash Can as a consolation prize. As long as the die result doesn’t match any tokens that they have already collected, they may roll again and continue collecting tokens. If the player manages to collect all 6 tokens, they immediately move to the Resolve Tokens step but are also awarded a bonus turn. On their bonus turn, they may only collect up to 3 tokens. The next step is to resolve tokens. Once a player decides to stop rolling the die or if they’ve collected all 6 tokens, they must then resolve each of the tokens that they collected. The player is allowed to resolve each token in any order that they choose. Once a token has been resolved, it is placed back into the middle of the play area. There are 6 different tokens. Each one provides a different action that the player may take. There is the token with 2 trash cans. This allows the player to draw up to 2 cards from the Trash Can into their hand. The 2 trees token allows the player to stash up to 2 cards from their hand by placing them face down in front of themself. The token with a trash can and a tree allows the player to choose between drawing a card from the trash can or stashing a card from their hand. The token with the hand and bag on it allow the player to steal a random card from another player’s hand. The mask token allows the player to draw the top card from the Trash Can and reveal it to the other players. It is then added to their hand. The other players may then stash 1 card from their hand that matches the revealed card. However it must be stashed face up. The player that used the token is then allowed to draw 1 card from the Trash Can adding it to their hand for each card that an opponent stashed in this way. The recycle token allows the player to exchange it for a token that was not previously taken by the player. However if all 6 tokens were collected, this token has no effect. It should be noted that once a player decides to start resolving tokens, they may not use any cards that were gained during that turn. They also may not start resolving tokens until they decide to stop rolling without busting. There are several different types of cards. Each one provides an action that may be used during the player’s turn. Some will provide points for having the majority of that particular card while others will thwart a steal attempt or even steal a card from the would be thief themself. For more information on each of the different card types, I will briefly touch on these in the gameplay section or you can check them out in the rulebook. The game continues until the last Trash Can card is drawn. Once this happens, the current player will finish their turn. Afterwards, the game ends. Each player must then discard any cards that remain in their hands, reveal their stashed cards and then sort them by type. Each player will then add up the total number of each card type and compare them with their opponents totals. Players will then score points based on who scored the most, second most and third most based on the numbers in the top left corner of each card. Players will also score 1 point for each Blammo! card that they stashed. Players will then add up their points and the one with the most points is the winner. Back several years ago, I was big into print and play board games. I really enjoyed printing out all these games that had never been made yet and being able to play them. After a while I came upon an artist that had been not only doing artwork for several lesser known games but had also been creating their own redesigns of some others as well. The designs were really fun and unique looking. Many were even better than the original designs for the games. I started following the artist and keeping an eye out for anything that he created, especially when it came to board games. So who was that artist? Well it was none other than the artist of this game, Kwanchai Moriya. Needless to say, I’ve been enjoying his artwork ever since. As a fan, it has been a joy to find his artwork present in this game. Trash Pandas has that unique artwork and style of Kwanchai Moriya that has made him famous. The cards are silly and fun to look at. Some of the words on the cards are spelled more phonetically than acurately which adds to the silliness. The idea that you’re a bunch of racoons digging through a trash can makes sense thematically with the spelling and the cards designs. I have to say that I really like the look of each piece of art and the look of each card. Speaking of the cards, they each have a really nice finish that is easy to shuffle. They’re definitely high quality. Next there are the tokens which are double sided and wooden. These appears to have either a screen printed or painted design on the white background. These same printed icons are also present on the etched die. The die is a little bit bigger than a normal die but shouldn’t be a problem even for small hands as players will only be rolling the 1 die. I have to say that both the tokens and the die are just as good in quality as the cards are. On top of everything else, the game even comes with a card that explains what each token action is and what it does referencing the iconography of the tokens. This is a nice added addition to the game. Overall this is a great looking little game and the artwork may make you a fan of Kwanchai Moriya like me. I can’t tell you how much that I love the overall look of it all. Great, great looking game. The rulebook for this game is a double sided piece of thick paper that folds up nicely to fit inside the game box. It’s full color and has plenty of great looking pictures on it. On one side there are all the rules with a step by step explanation of how to play the game. There’s also an explanation of the icons on the cards and how they work. There’s even a chart with all the different icons found on the die and what each of them mean. Simply put, it’s quite simple to read through and learn how to play. On the reverse side of the rulebook is a full color guide to each of the 8 different cards in the game. Each one is explained thoroughly and has a large picture of the card as reference. I have to say that I really like this side of the paper. To me, most of the cards are pretty self explanatory but it’s nice to have a more detailed explanation in case any questions arise while playing the game. Honestly I think the rulebook looks quite great. It doesn’t take long to read and is easy to understand. In my book, that’s a win right there. This is such a fun little game. It takes the mechanics of set collection and press your luck and then sprinkles in a little bit of hand management and take that for good measure. The press your luck comes in as each player rolls that die on their turn. They’ll start collecting tokens but then they have to decide, “do I want to take what I’ve already got, or do I want to try for some more tokens to do more stuff with.” Ultimately, that little devil on your shoulder will convince you that greed is the way to go and you won’t roll one of those tokens that you already collected. Of course, greed can sometimes lead to your downfall, which means busting and winding up with only 1 card from the deck. Don’t worry though, as your opponents are going through the exact same internal struggle themselves. The set collection part of the game shows up as you use those tokens that start allowing you to stash cards where your opponents can’t touch them. The more you get of a certain card, the more likely that you’ll be able to have the majority and thus gain the most points possible. Thankfully each card shows exactly how many of that particular card type are in the game, so with some close attention and maybe a little bit of card counting, you can possibly figure out just how far ahead or behind you may be. The hand management comes into the picture when simply dealing with the cards. Figuring out when to use a card and when to stash it for the points is the major point. Sometimes using those cards will be a big help. Sometimes you’ll want to keep them for points. It’s a major balancing act. The take that aspect kicks in when using the token that allows you to steal from an opponent. Sometimes things work out great and you’ll luck up, then sometimes they happen to have one of those defense cards that will block your attempt, or even worse turn your thievery against you. That’s when the take that gives it right back to you. Needless to say, you can see that there’s a lot of fun to be had with this game. It’s one that will garner some laughs and even a few groans of agony as a player busts while rolling the die. This is a great family friendly game that kids and adults can enjoy together. My daughter and I really like this game a lot. I think most players will enjoy this game, especially those with kids. I would highly recommend it. It’s a great little card game with some really fun looking artwork and designs. 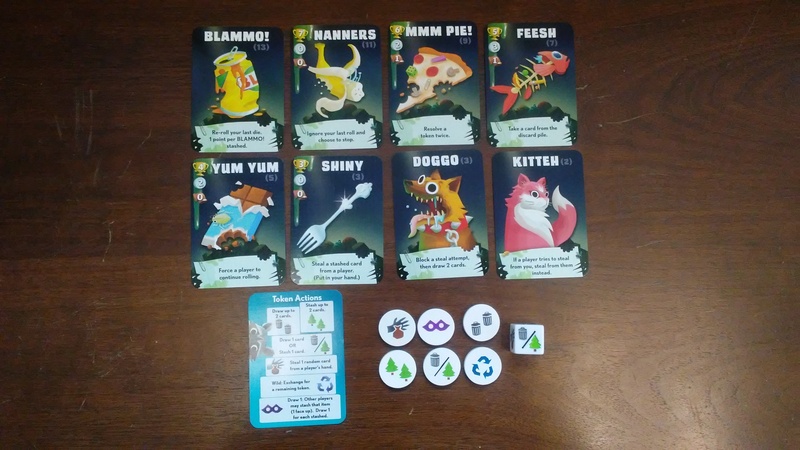 Trash Pandas is a fun card game about digging through the trash that combines the set collection and press your luck mechanics. It’s not a very long game. Most game sessions last around 20 minutes or so. The components are all extremely well done. The artwork of Kwanchai Moriya is really fun and light in this one and I really enjoy it. The rulebook does an excellent job on explaining the rules as well as telling how each card works in detail. The game itself is light and fun. Player interaction is fairly moderate with most of the interaction coming from using the thieving tokens. There is a bit of strategy when it comes to figuring out when to use a card for it’s ability and when to simply stash it for points. There’s also some great decision making when it comes to knowing when to keep rolling and when not to push your luck. This works as both a great filler card game and an awesome family game. Kids will enjoy this one and adults will like it as well. My daughter and I really like this one a lot. This is a game that I would highly recommend. It’s the one time that your Mom will say it’s ok to play in the trash can. For more information about this and other great games, please check out Gamewright at their site. This entry was posted in Reviews and tagged board, board games, card, card games, eskue, games, gamewright, gamewright games, lisa, lisa eskue, Lisa J. Eskue, michael, Michael E. Eskue, michael eskue, pandas, trash, trash pandas. Bookmark the permalink.